The most distinctive features of this genus are the intermediate number of occipital folds, the low number of hooks on the manus, and the high number of suckers on the distal portion of the club (30-40). These suckers cover the terminal pad and the distal portion of the club proper. Marginal suckers absent proximally; may flank hooks V8 and V9 through at least 177 mm ML in N. africanae. Figure. 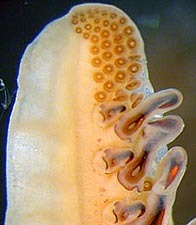 Oral view of the tip of the tentacular club of N. africanae, 40 mm ML. Note the distinct change in sucker size between the dactylus and the terminal pad. Photograph by R. Young. The arrow in the photograph to the left points to the olfactory organ on occipital fold no. 2. Figure. Dorsolateral views of the head of N. africanae. Left - 5 of the 6 occipital folds visible, 69 mm ML, preserved. The arrow points to the olfactory organ on occipital fold no. 2. Photograph by R. Young. 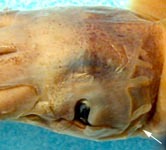 Right - 6 of the 7 occipital folds visible (fold no. 1 not visible), holotype. Drawing modified from Nesis, et al. (1998). Gladius visible dorsally only between fins. Figure. Dorsal view of mantle and fins of N. africanae, 69 mm ML. Photograph by R. Young. Except for the photographs, this description is from Nesis et al. (1998) and Bolstad (2007). According to Nesis et al. 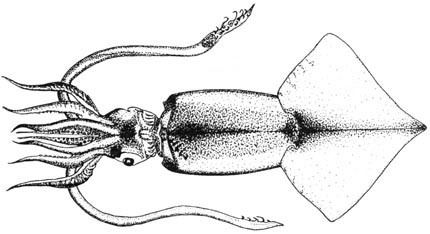 (1998), this genus erected for squid that had previously been identified as a "Notalian form" of Onychoteuthis banksii, a South Atlantic form of Ancistroteuthis lichtensteinii, or as Onykia (?) verrilli (Pfeffer). Nesis, K. N., M. A. C. Roeleveld and I. V. Nikitina. 1998. A new genus and species of onychoteuthid squid from the Southern Ocean. Ruthenica 8:153-168.